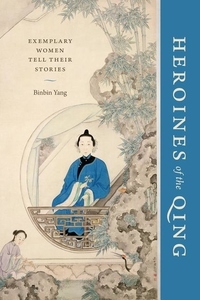 Heroines of the Qing introduces an array of Chinese women from the eighteenth and nineteenth centuries who were powerful, active subjects of their own lives and who wrote themselves as the heroines of their exemplary stories. Traditionally, "exemplary women" (lienu)--heroic martyrs, chaste widows, and faithful maidens, for example--were written into official dynastic histories for their unrelenting adherence to female virtue by Confucian family standards. However, despite the rich writing traditions about these women, their lives were often distorted by moral and cultural agendas. Binbin Yang, drawing on interdisciplinary sources, shows how they were able to cross boundaries that were typically closed to women--boundaries not only of gender, but also of knowledge, economic power, political engagement, and ritual and cultural authority. Yang closely examines the rhetorical strategies these "exemplary women" exploited for self-representation in various writing genres and highlights their skillful negotiation with, and appropriation of, the values of female exemplarity for self-empowerment.